Like the face, the human nose is well vascularized with arteries and veins, and thus supplied with abundant blood. The principal arterial blood-vessel supply to the nose is two-fold: (i) branches from the internal carotid artery, the branch of the anterior ethmoid artery, the branch of the posterior ethmoid artery, which derive from the ophthalmic artery; (ii) branches from the external carotid artery, the sphenopalatine artery, the greater palatine artery, the superior labial artery, and the angular artery. The external nose is supplied with blood by the facial artery, which becomes the angular artery that courses over the superomedial aspect of the nose. The sellar region (sella turcica, “Turkish chair”) and the dorsal region of the nose are supplied with blood by branches of the internal maxillary artery (infraorbital) and the ophthalmic arteries that derive from the internal common carotid artery system. 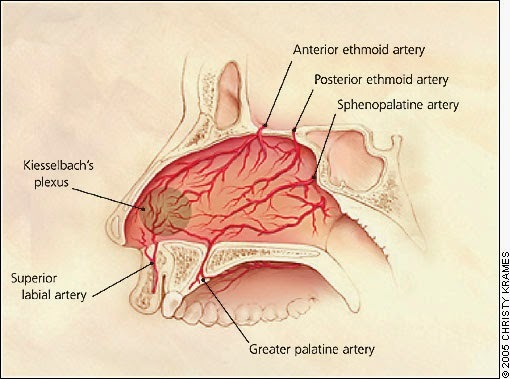 Internally, the lateral nasal wall is supplied with blood by the sphenopalatine artery (from behind and below) and by the anterior ethmoid artery and the posterior ethmoid artery (from above and behind). 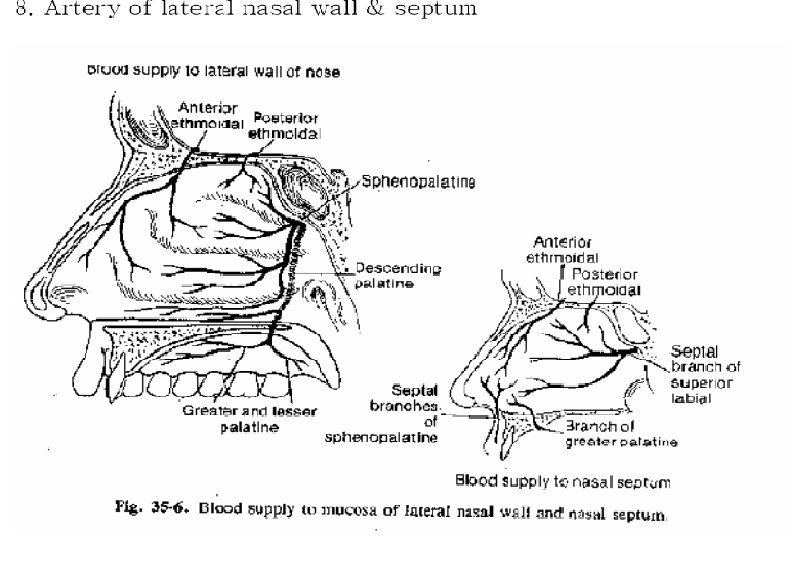 The nasal septum also is supplied with blood by the sphenopalatine artery, and by the anterior and posterior ethmoid arteries, with the additional circulatory contributions of the superior labial artery and of the greater palatine artery. These three (3) vascular supplies to the internal nose converge in the Kiesselbach plexus (the Little area), which is a region in the anteroinferior-third of the nasal septum, (in front and below). Furthermore, the nasal vein vascularisation of the nose generally follows the arterial pattern of nasal vascularisation. 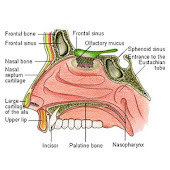 The nasal veins are biologically significant, because they have no vessel-valves, and because of their direct, circulatory communication to the sinus caverns, which makes possible the potential intracranial spreading of a bacterial infection of the nose. Hence, because of such an abundant nasal blood supply, tobacco smoking does therapeutically compromise post-operative healing. The pertinent nasal lymphatic system arises from the superficial mucosa, and drains posteriorly to the retropharyngeal nodes (in back), and anteriorly (in front), either to the upper deep cervical nodes (in the neck), or to the submandibular glands (in the lower jaw), or into both the nodes and the glands of the neck and the jaw. Approximately 5% to 10% of epistaxis is estimated to arise from the posterior nasal cavity, in an area known as Woodruff’s plexus. Woodruff's plexus is located over the posterior middle turbinate and is primarily made up of connection of branches of the internal maxillary artery, namely, the posterior nasal, sphenopalatine, and ascending pharyngeal arteries. Posterior bleeds usually originate from the lateral wall and more rarely from the nasal septum. Rebuilding a damaged outer nose has similarities to rebuilding an A-frame house. Both structures have an architectural framework that provides structural support and determines the overall, length, width and shape of the structure. In order to modify the structure's shape, the framework must be exposed and then physically reconfigured. In the nose, the structural framework is the nasal skeleton, consisting of cartilage and bone, whereas the house is typically wood and concrete. However, unlike a house, the nasal framework is composed entirely of living tissue – tissues that must have a constant flow of blood to remain viable. In the nose, nutrients such as oxygen, glucose, minerals, etc, are delivered to the skeletal framework through a network of tiny blood vessels found within the overlying skin and underlying mucous membranes. By necessity, any type of nasal surgery (or nasal injury) causes varying degrees of damage to this circulatory network. While the human body has an incredible capacity to heal from such damage, recovery is never fully complete and some blood vessels are permanently lost. Fortunately, the nasal circulation has excess capacity, so the overall circulatory impact of a well-executed surgical intervention is usually negligible. However, repeated surgeries, especially when combined with poor surgical technique, can eventually impair circulatory function. Moreover, the surgery itself causes additional temporary circulatory impairment as a consequence of swelling and inflammation. When the total circulatory impairment exceeds the threshold for minimal tissue perfusion, tissues become oxygen-deprived, or ischemic, and complications such as cell death, infection and tissue resorption soon develop. Because revision rhinoplasty relies almost entirely upon the transplantation of cartilage into the nose, a healthy recipient blood supply is a key element in ensuring survival of grafted tissues. A robust circulation not only ensures prompt re-vascularization of the transplanted cartilage grafts, it also lowers the risk of infection and graft resorption. Gentle surgical technique, avoidance of tobacco or nicotine, and good supportive care can help to optimize circulatory support to the vulnerable grafted tissues. However, in noses with severely damaged circulation, such as those subjected to multiple previous rhinoplasty procedures, the likelihood of graft resorption, infection, and even skin necrosis (death) are increased, especially when coupled with smoking, infection, cocaine abuse, excessive swelling, diabetes or other conditions, medications or supplements that impair circulation. In this patient population, good surgical technique is often negated by poor circulation and the results of surgery are usually disappointing. Arch Otolaryngol Head Neck Surg. 1996;122(1):24-34. doi:10.1001/archotol.1996.01890130020003. Nasal tip blood supply: an anatomic study validating the safety of the transcolumellar incision in rhinoplasty. Rohrich RJ, Gunter JP, Friedman RM. The nasal tip blood supply was studied through anatomic dissections and microangiography in 31 fresh cadaver specimens. The lateral nasal artery was present in all specimens, bilaterally in 30 (97 percent) and unilaterally in one (3 percent) and was located in the subdermal plexus 2 to 3 mm superior to the alar groove. The columellar branch of the superior labial artery was visualized bilaterally in 3 specimens (9 percent) and unilaterally in 21 (68 percent), and was absent in 7 (23 percent). Transcolumellar (external rhinoplasty) incisions were performed in 11 of these cadavers prior to dye injection. A consistent crossover flow (100 percent) was seen from the lateral nasal artery arcades to the distal aspect of the transected columellar branches. We conclude that nasal tip blood supply is derived primarily from the lateral nasal arteries, with a variable contribution from the columellar arteries. Collateral flow to the nasal tip may be provided by branches of the ophthalmic artery. The external rhinoplasty transcolumellar incision does not compromise nasal tip blood supply unless extensive tip defatting or extended alar base resections (above the alar groove) are performed. Blogger N.B. It is my personal belief that repetitive reopening of the same external incision can increase the possibility of developing necrosis &/or serious cutaneous nerve damage ie.Neuroma's. Of course there are other factors to consider as mentioned above and consideration as to the location of where the original external incision was made is of utmost importance. The question of "How many times can a nose take an open rhinoplasty w/o damaging the skin" was posed on the realself website. There's differing opinions from rhinoplasty surgeons. Good vascularity is not only important in viability of bone/cartilage, synthetic implant grafts but equally important in viability of skin grafts and flaps. Injectable fillers can cause vascular occlusion. I would speculate that over cauterization of a specific area may also be a concern as to compromising vascularity. I Very much enjoyed reading this blog about rhinoplasty surgery. Thanks for sharing such a supportive information.